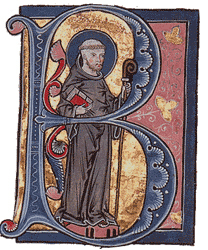 Alberic of Trois-Fontaines (French: Aubri or Aubry de Trois-Fontaines; Latin: Albericus Trium Fontium) (died c. 1252) was a medieval Cistercian chronicler who wrote in Latin. He was a monk of Trois-Fontaines Abbey in the diocese of Châlons-sur-Marne. He died after 1252. Cistercian architecture is a style of architecture associated with the churches, monasteries and abbeys of the Roman Catholic Cistercian Order. It was headed by Abbot Bernard of Clairvaux (d. 1153), who believed that churches should avoid superfluous ornamentation so as not to distract from the religious life. Cistercian architecture was simple and utilitarian. Although images of religious subjects were allowed in very limited instances, such as the crucifix, many of the more elaborate figures that commonly adorned medieval churches were not. Their capacity for distracting monks was criticised in a famous letter by Bernard. Early Cistercian architecture shows a transition between Romanesque and Gothic architecture. Later abbeys were also constructed in Renaissance and Baroque styles which were more ornate by nature, but still demonstrated considerable austerity compared to other buildings built in those architectural styles. In terms of construction, buildings were made where possible of smooth, pale, stone. Columns, pillars and windows fell at the same base level, and if plastering was done at all, it was kept extremely simple. The sanctuary kept a simple style of proportion of 1:2 at both elevation and floor levels. To maintain the appearance of ecclesiastical buildings, Cistercian sites were constructed in a pure, rational style; and may be counted among the most beautiful relics of the Middle Ages.Most Cistercian abbeys and churches were built in remote valleys far from cities and populated areas, and this isolation and need for self-sustainability bred an innovativeness among the Cistercians. Many Cistercian establishments display early examples of hydraulic engineering and waterwheels. After stone, the two most important building materials were wood and metal. The Cistercians were careful in the management and conservation of their forests; they were also skilled metallurgists, and their skill with metal has been associated directly with the development of Cistercian architecture, and the spread of Gothic architecture as a whole. Cistercian nuns are female members of the Cistercian Order, a religious order belonging to the Roman Catholic branch of the Catholic Church. Donald Campbell (Scottish Gaelic: Dòmhnall Caimbeul) (died 1562) was a 16th-century Scottish noble and churchman. He was the son of Archibald Campbell, 2nd Earl of Argyll and Elizabeth Stewart, daughter of John Stewart, 1st Earl of Lennox. From 1522, he was a student of St Salvator's College, at the University of St Andrews. After graduation, he became a cleric in his home diocese, the diocese of Argyll. Monastic granges were outlying landholdings held by monasteries independent of the manorial system. The first granges were owned by the Cistercians and other orders followed. Wealthy monastic houses had many granges, most of which were largely agricultural providing food for the monastic community. A grange might be established adjacent to the monastery but others were established wherever it held lands, some at a considerable distance. Some granges were worked by lay-brothers belonging to the order, others by paid labourers.Granges could be of six known types: agrarian, sheep or cattle farms, horse studs, fisheries and industrial complexes. Industrial granges were significant in the development of medieval industries, particularly iron working. Pope Eugene III (Latin: Eugenius III; c. 1080 – 8 July 1153), born Bernardo Pignatelli, called Bernardo da Pisa, was Pope from 15 February 1145 to his death in 1153. He was the first Cistercian to become Pope. In response to the fall of Edessa to the Muslims in 1144, Eugene proclaimed the Second Crusade. The crusade failed to recapture Edessa, which was the first of many failures by the Christians in the crusades to recapture lands won in the First Crusade. Robert King (died 1558) was an English churchman who became the first Bishop of Oxford. Scriptorium ( (listen)), literally "a place for writing", is commonly used to refer to a room in medieval European monasteries devoted to the writing, copying and illuminating of manuscripts by monastic scribes. Simon de Tosny (Toni, Tonei, Toeni, Toeny, Toney) was a 12th-century Cistercian monk and prelate. Simon was a monk of Melrose Abbey, and served there until he moved to become Abbot of Coggeshall Abbey in Essex. He resigned this abbey in 1168, and returned to Melrose. In 1171, he was elected as Bishop of Moray, and was consecrated at St Andrews on 23 January 1172. His cathedral was at Birnie, Moray. He witnessed several charters and was present at the Council of Northampton in 1176. He is the first bishop named on the bishop-list in the Moray Registrum. He died on 17 September 1184 and was buried in Birnie Kirk. Aside from the brief episcopate of Andrew (consecrated 1184, died 1185) he was succeeded as bishop by Richard de Lincoln. Stefan (before 1143 – 18 July 1185) was created the first Archbishop of Uppsala in Sweden in the year 1164, a post he held until his death. Stefan was a Cistercian monk from Alvastra monastery (of which he was one of the founders in 1143). His origin is not known, but it is believed that he was originally from England or Germany because many monks from the monastery were from those countries and because his name was rather uncommon in Sweden at that time. In 1164 Stefan travelled to Sens in France to meet Pope Alexander III. The Pope was seeking refuge in Sens because of disputes in Rome. Present in Sens was another refugee: the archbishop of Lund (Denmark), Eskil, who had supported the wrong king in Denmark and thus been forced into exile. The Pope agreed to grant Sweden an archbishop. This matter had already been discussed a decade earlier, but because of civil conflicts was never realized. A pallium had, however, been made in Lund for that occasion, and Eskil had brought it with him when he left Denmark. The pallium was now given to Stefan. The archbishop of Lund was declared primate of Uppsala, and thereby given the right to ordain the archbishop of Uppsala. The primateship was upheld for a century until political conflicts between the two countries led to the independence of the Uppsala archbishopric, and thereafter the archbishop would travel to Rome to be ordained by the pope. What is likely to be a protocol from the Sens meeting is still in existence at the Swedish Royal Library. Vallbona de les Monges (Catalan pronunciation: [ˌbaʎˈβɔnə ðə ləz ˈmɔɲʒəs]) is a municipality in the comarca of the Urgell in Catalonia, Spain. It is located at the southern end of the comarca, north of the Serra del Tallat, Catalan Pre-Coastal Range, where many wind turbines have been installed. The town has the most important convent in Catalonia, the Monastery of Santa Maria de Vallbona, belonging to the Order of Cistercians. The main income is derived from wine and olive oil production, as well as some cattle. There is a little tourism, but not enough to significantly lift the economy of the area.